I’d booked a cheap advance 1st class ticket down to London, hoping for a relaxing afternoon. Thanks to a jam on the M1, I ended up doing a wacky-races style mad dash through the back-lanes of Derbyshire to make it home from work in time to catch the train. I made it with five minutes to spare. And in those five minutes noticed that one of my rucksack straps was attempting to part company from my rucksack. Arse! The train journey was then blighted by the bloke opposite making a series of loud self-important phone calls. And I’d forgotten quite how much ‘fun’ travelling across London in the rush-hour with baggage is. I eventually checked into the Travelodge in Woolwich and went out to buy Dominos pizza, super-glue and duct tape. All the ingredients for a fun weekend! I successfully restrained myself from eating any of the pizza (it was going to be ~1/4 of my calories for the race). And in another minor triumph I also reattached the strap to my rucksack, without attaching myself to it permanently. On the race facebook page there’d been a lot of discussion about pack weight, and a lot of people were planning on carrying more than my 8kg. However at the start there were a few very small, light looking packs. Someone fast could plausibly do the 184 miles in a single push, and therefore get away with carrying the minimum kit required by the rules. But would anyone actually manage this? The race start was way more restrained than I was expecting. I’m usually right at the back for the first 20+ miles, but here it didn’t feel like that (and in fact, according to the other-half who followed the race trackers online, I was at the front of the middle of the pack from the outset). I settled straight into a 25:5 run:walk-eat routine. Several people asked me if I was OK as they over-took me during my early walk breaks. I said “yes thanks” and suppressed the urge to add “have you not heard of a run-walk strategy?”. Following the route through London was a bit tricksy. There were lots of small wiggles which were too small to show up on the (enlarged) 1:40 000 maps we’d been given. There were signposts, but some had been messed with, and sometimes we’d follow one, only to discover that it was the end of a wiggle that we’d missed the start of and now we were going in the wrong direction. There was also one wiggle which led to a locked gate... Along the way I had a chat with Kate & Ernie, two TR250 finishers who quizzed me about the Spine. I was planning to quiz them about TR250 later, but in fact this was the last I’d see of them until the finish. The crowds in central London provided another challenge. Several times I stopped and walked rather than risking a camera wielding tourist stepping backwards and knocking me flying. It didn’t help that I had to keep a careful eye on my feet. I’d done all of my pack training off-road and kept going over on my ankles on uneven paving slabs. The race rules said we had to leave checkpoints with a minimum of 1.5 litres of water. Due to the limited access to water on the first stage I carried 2 500ml soft flasks in addition to my 2 750ml Camelback bottles. Part way through the stage we passed some public toilets, but I didn’t stop and refill as I had more than half my water left. It was a warm afternoon though and later on I had to make a detour into a park to top my supplies up. I arrived at checkpoint 1 (in an alley outside a pub) in just under 6 hours. A bit slower than I’d hoped/planned, but not surprising given the fiddly route and crowd dodging. Despite this, I enjoyed the first stage. Seeing major sites, like the Shard, appear in the distance and then disappear behind me, really emphasised how far we were going. I sat down on the floor briefly and aired my feet and ate some pizza. People seemed amused/surprised by the pizza-most of the other mid-pack runners were sparking up Jetboils and eating Expedition meals. I was familiar with most of this section from the 2013 TP100. Fortunately the weather was a lot better and the ground under foot much less muddy. I kept up the 25:5 run-walk strategy until dusk. By then 25 minutes of running were becoming a bit of a struggle (not a surprise given the pack-weight) and I switched down to 10:5. I also stopped in some public toilets to change into night-gear. I’d planned to keep my thin long sleeve top on through the night but I’d drenched it with sweat. I also realised, from the colour of only my 2nd wee of the race, that I was probably dehydrated from rationing my water supplies during the first stage. Just before Staines it started raining heavily and I stopped again to put on my waterproof jacket. The rain was a bit frustrating. It alternated between fairly heavy (and jacket definitely required) and drizzle, where I’d over-heat. I normally have no problems running through a single night, and my vague plan was to not stop and sleep until the 2nd night. However already I was feeling tired and sleepy. The wheels fell off just after Staines and I walked the last couple of miles to the checkpoint. Many of the checkpoints were located at pubs, and I’d formed a mental picture of sitting in a function room, in the dry. So it came as a bit of a shock to be directed to some benches by the riverside (in retrospect this was completely appropriate given the unsupported nature of the event). I was also somewhat taken aback to be told I was 3rd woman. I think my reaction was “whaaaat!”. I sat down on one of the benches and ate some pizza. And to my even greater surprise saw Simone (i.e. the 2nd place woman) just leaving. Even with all my layers on it was too cold and wet to sit for long, so I soon headed out again myself. I settled back into my 10:5 run:walk routine, and went back and forth with 2 blokes. I got a bit confused in Windsor when the route deviated from the TP100 route. It wasn’t long until I was feeling really sleepy, and when the route doglegged away from the main path, I decided to stop and try and grab a couple of hours sleep. I couldn’t nod off though and after 45 minutes lying in my sleeping bag in my bivy I was shivering, so I gave up and got going again. The break had perked me up and I managed half an hour of solid running, before switching back to the run-walk routine. The one problem with this was temperature control: while running I’d over-heat and then the sweat would chill me during the walk breaks. Along the way I passed various groups of runners bivvied out, sometimes with running gear and Jetboils strewn around them. At Cookham at dawn I felt really sleepy again and tried, and failed again, to sleep in the porch of the church. Shortly afterwards I passed two blokes who appeared to be attempting to sleep bolt upright on a park bench. The rest of the route was new to me (the 2013 TP100 was rerouted onto an out and back course due to flooding), but at this point the navigation was fairly straightforward. I went back and forth with another two blokes as the day warmed up and I kept stopping to strip off layers of clothing. I had another bad spot coming into Henley and ended up walking it in. I’d been slowly catching a bloke wearing even more purple than me, but he ran away from me. It was now mid morning, and there were lots of people of all ages and shapes out rowing. I briefly thought that rowing looked like fun, but then came to my senses. After some brief confusion, when I encountered some supporters looking for the checkpoint at the pub location we’d originally been given, I eventually made it to checkpoint 3. This wasn’t one of the designated sleeping checkpoints, but various runners had slept there. I wished this had occurred to me-I might have done a better job of both sleeping and pushing through the night. I sat down on the floor, ate some more pizza and inspected my feet. Just one small blister on a toe. The purple bloke had huge blisters on his toes and (I later discovered) stopped here. As I packed up to leave Simone came into the checkpoint. I guess she’d been in one of the groups I’d passed bivvying overnight. Which made me, for now at least, 2nd woman. Gulp. There were lots of runners at CP3, some of whom had stopped for something approaching a proper nights sleep, so I was expecting loads of people to stream past me. Early on Kevin, who went on to finish 3rd, piled past, moving faster than I can with fresh legs and no load. But otherwise I only saw a couple of other runners on this stage. Before Reading there was a stretch of single track where I had several close encounters with mountain bikers, who piled around blind bends at high speed. I was unimpressed (and had to restrain myself from shouting ‘that’s quite alright’) at the lack of thanks for stepping off the narrow track to let them by. Me: “Sorry I don’t know where the shops are, I’m not from around here”. I was also joined briefly by a bloke who’d been following the race at home and had come out to meet some of the runners. We chatted for a bit as I kept running. I tried to ignore the fact that he was easily keeping up with me, while walking. Being told that I was in 16th place was a surprise though, and perked me up. Around Whitchurch-on-Thames the wheels fell off a bit. I went rapidly from ‘run-walking’ to walking to struggling to walk. A quick sit down and a Mars bar got me going again, and I actually enjoyed the one properly hilly section of the route. I caught someone who’d passed me in Reading looking strong only a few miles before. Now he was struggling and would drop at the next checkpoint in Goring. Just before Goring Lee B caught me, powering along with his poles. We chatted for a bit and I discovered that while he hadn’t run a 100+ mile race before he was a much, much faster runner than me (with a 100k PB faster than my 50 mile PB...). We got to Goring, at about 100 miles, at ~4pm, just under 30 hours after the start. A couple of hours slower than I hoped, but not bad going given the pack weight (and 4 or 5 hours faster than my first two 100s...). I was surprised more people, and in particular women, hadn’t caught me. The Sun was shining, and a handful of runners were sleeping at the checkpoint. Some right by the checkpoint van and others in the adjacent paddock. Beforehand I’d thought I wouldn’t need to sleep at this point and half-planned to push on to Oxford or even beyond. But I was feeling pretty tired so grabbing a couple of hours sleep before the temperature plummeted overnight seemed like a good idea. First I phoned the OH to tell him of my change of plans, so he wouldn’t worry about my tracker not moving. It was also an excuse to try and get some info about the whereabouts of the other women. In particular I’d been getting conflicting info about the leading woman. She’d been at, or close to, the front of the race, but a lot of the front runners had dropped. The OH was at a wedding, so couldn’t check the tracker then, but promised to do so before he went to bed and text me the positions of the other women. I crawled into my bivy bag in the paddock, initially leaving my kit strewn around me. After a while though it started raining, and I frantically stuffed everything into or under the bag. I did manage to sleep, but only in restless 15 minute bursts. Eventually I gave up and got ready to get moving again. I had a decent sized blister on the ball of one foot, which I drained and dressed, before having my ‘dinner’ (more cold pizza and hula hoops). During this process a group of runners, including Simone, arrived. So, to my surprise, I was still hanging on to the 2nd woman position. Me: ’Just to let you know, I’m off now’. Bloke with clipboard: ’Oh. I thought you left several hours ago’. Thankfully, the woman who’d been wielding the clipboard when I arrived then appeared and sorted out the confusion. I decided (after my temperature control problems the night before) that my best bet was to walk through the night at a constant (but hopefully not too slow) pace. There were a couple of hours of daylight left, and it was a pleasant evening but already beginning to chill. At one point I was surprised to see runners going in the opposite direction on the other side of the river. Had I gone badly wrong, or had they? 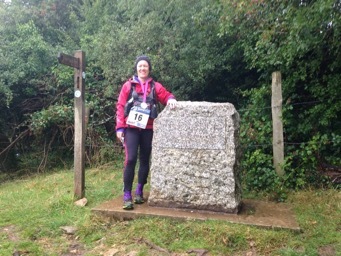 Then I remembered that the Ridgeway 85 (one of my two Ultra DNFs back in 2010) was also taking place. Approaching a small country lane, miles from anywhere, a woman appeared and shouted ‘Is that Anne?’. ‘Umm, yes’. I was a bit confused. It turns out that she had a friend who had started the race and DNFed and, after watching the trackers on line, had come out to meet some of the participants. We chatted for a bit and she told me that the leading woman was in fact in the lead overall. She also took a picture and emailed it to the OH. The Sun was going down so I put my layers on for the night, before heading off. At Benson the riverside path was closed and it wasn’t obvious where the diversion went. There was an obvious alternative by road, but I didn’t want to go wildly off-route. So uncharacteristically (I don’t like asking for help) I flagged down a passer-by and asked if he knew where the diversion went. It turned out the diversion was the obvious road alternative. Back on the riverside path, I caught a group of ‘normal’ people. It was pub kicking-out time so I was a bit wary about this encounter. However it turned out they were rowing a section of the Thames and were on the way back to their wild camp for the night. Seeing their tents made me think how nice it would be to stop and sleep. And shortly afterwards I started hallucinating. Not full blown talking to imaginary friends or worrying about treading on gnomes hallucinations. But ‘oh look there’s a penguin... oh no it’s a rock. And there’s a lop-eared rabbit,... oh no it’s another rock. And there’s a wicker sculpture of an athletic looking woman in that tree. Oh no it’s just some branches’ (A psychologist would have a field day with what I was ‘seeing’). As the night went on the path got narrower, and as I got more and more sleepy it got harder to stay up-right. The temperature was also varying a lot. It was always cold, but there were some patches where the temperature seemed to plummet. At one of the locks there were a couple of runners bivvied out, so I decided to join them for a 45 minute nap (after activating the lock house security lights while blundering around looking for a toilet). The nap perked me up, and for a couple of miles I felt good. I then got to Abingdon. First there were sections were the river curved pointlessly (and it would have been far quicker and easier to ‘cut the corner’). Then there was a narrow muddy section through woodlands where the path kept bending back on itself and I got paranoid that I was going in the wrong direction. This was followed by some good, but never-ending, path past Radley and into Oxford. Dawn came and I was expecting to see the ‘dreaming spires’ in the distance at any moment but they never really appeared. I got really sleepy again, and couldn’t resist a 5 minute power-nap propped against a rusty metal fence. Eventually I got to Oxford, which was a bit surreal. I lived in Oxford for 3 years as a student (a couple of hundred metres from the checkpoint in fact). But I never ventured onto the paths alongside the river back then, so I passed through somewhere that used to be home without really seeing anything familiar. Given how sleepy I was, I decided another nap would be a good idea. The two blokes manning the checkpoint (one of whom, Chris, had stayed to help out after dropping out due to injury) gave me a choice of two park benches. I chose the marginally more comfy looking one and dozed for another 45 mins. During this time Lee B passed through; he’d stopped to sleep over night and I’d passed him without knowing. I had a quick breakfast (more cold pizza) and assessed my food supplies. It was becoming clear a 60 hour finish wasn’t happening and I was going to have to ration my calories. I put aside a handful of gels and a Mars bar to see me through a 3rd night. I also inspected my feet. Superficially they looked a bit of a mess (loads of dead skin from trashing them in the Lakes was falling off), but actually they weren’t too bad. My taping had stopped the blister getting worse but had caused another blister further along (when it rucked up under my toes). It also looked like the other foot might be starting to blister. To the bemusement of the checkpoint guys I tried to see if there was any fluid under the skin by hitting it. It seemed like a good idea at the time... I was also unsure of how many layers to remove. The Sun was well and truly up, but the checkpoint was in a sheltered spot. Eventually (and after putting on and fastening my rucksack and front pack) I decided that 2 jackets was over-kill and that I should remove 1 of them. Just before I waddled out of the checkpoint (‘looking good’, ‘yeah right’) a group of 3, including the two-some whose bivvy spot I’d crashed, arrived. The first few miles out of Oxford were quite pleasant. As the Sun got high in the sky it started to get quite hot, and I took off not just my jacket, but also my long-tights and thick base-layer too (replacing them with 3/4 tights and a thin top rather than carrying on in just my underwear...). I had a couple of goes at running, but after walking through the night it felt really slow and cumbersome, and I convinced myself (far too easily) that I’d be better off just walking at a steady pace. I had a shouted conversation with a friendly couple on a canal boat about what I was doing. And then a couple of less positive encounters with dog-walkers which brought my mood crashing down. Twice pairs of large dogs charged at me and then circled me, while the owners didn’t give a toss and made no attempt to call them back. In one case the dogs even head-butted my bum! Normally I’d have told the owners exactly what I thought of their behaviour, but I didn’t trust myself not to lose it completely (or cry). Then, just to rub things in, one of the dog-walkers had spent a lot of time jamming a gate firmly shut (despite the fact he could see me coming in the opposite direction) and in opening it I removed a slice of flesh from one of my thumbs. I tried to walk fast, but this didn’t last long and soon I sat down on a concrete block for a snack. The concrete block was in fact part of a bridge, and I had to get up again to let some people through. I then took a deliberate detour around a crowded pub beer garden as I couldn’t face walking through it. Once no-one was in sight I sat down and had a 5 minute power-nap which perked me up a bit. Over the last couple of hours the penny had slowly dropped that this stage was a bit longer than I’d originally thought. With 22 miles on the clock since Oxford there was still another 3 or 4 to go. Time for another power nap. The last stretch to the checkpoint at Radcot didn’t drag as much as the preceding sections though. Shooing some large cattle off the path provided a minor diversion. Checkpoint 6 was one of the designated sleeping checkpoints, and I desperately needed another ‘proper’ (i.e. 45 minute, rather than 5) sleep. However as Radcot came into sight the world’s worst pub cover band came into earshot. Chris came out from the checkpoint to meet me and I moaned about the never ending pink bushes. At the checkpoint I ate my final slice of (now legendary) cold pizza and (at their request...) showed people my blisters, before heading off to find somewhere quieter to sleep. A mile or so out from the checkpoint I found a suitable spot under a tree and, after a quick (and slightly more upbeat) call to the OH, settled down for a couple of hours of not too fitful sleep. I was expecting a lot of the people behind to catch and pass me while I was stopped, but knew I was too tired to sensibly keep going through the night. [I later discovered that only one person passed me while I was stopped, and I re-passed him without knowing during the night.] As I was packing up Mark appeared and set up camp. I sheepishly told him about my five minute power-naps, and he admitted he was doing something similar. The next short section didn’t seem to take too long. There were various things to keep me entertained. Firstly a field full of frisky heifers that charged en masse every time I turned my back on them, and needed very firm shooing. Then a disorientating labyrinthine section around Buscot where the path was fenced tightly into the river and the river meandered lots. And finally a section of the A361 with fast moving traffic (which according to the Thames Path map ‘is best negotiated by taxi or bus’). At least the head-lights gave me plenty of warning to jump onto the sloping verge. In the midst of the fun and games someone came out of a dinner party to ask if I was doing T184 and did I need any water. The benefits of my sleep wore off after a couple of hours and I reverted to regular power-sit-naps, even when it started raining. A couple of miles out from Castle Eaton I made my first navigation error. After crossing two bridges I needed to turn right, but initially I turned too soon. At the time I thought I’d lost my ability to count to two, but later that night I discovered that not all the small bridges were marked on the map. I quickly became suspicious that reality wasn’t matching the map and my compass confirmed that I was going in the wrong direction. I back-tracked and soon spotted one of the pieces of tape that had been put out to mark the last two stages. The last stretch into Castle Eaton was on tarmac and easy to follow, and I soon came across Cliff, who’d come out from the checkpoint to meet me. We burbled at each other about various races (Spine, Viking Way,...) while I tried to force feed myself as many of my remaining chopped Hula Hoops as I could. Cliff showed me the where the route continued and I headed off into the rain, while he headed in the opposite direction to meet Lee S and Ernie who were not far behind me. Crossing the first field I headed towards what I thought was a reflective sign on a gatepost. The fluorescent green blob was in fact the eyes of a small creature which proceeded to stalk me. This was a bit unnerving, but whatever it was, it wasn’t very big. The first part of this stage stuck closely to the river as it meandered through fields. The number and direction of the bridges on the ground didn’t match the map and, since the route was quite clear, I gave up on keeping track of my position on the map. Later on the path crossed the river and climbed above it. The Spine race honed my ‘National Path acorn symbol’ spotting skills, but at one point I moved away from the fence line to avoid a boggy area and missed a turn. The lack of TP signs and tape made me suspicious that I’d gone wrong, but there was still a path on the ground. The battery life on my Ambit had run out a couple of hours before so I couldn’t check my location. In similar situations earlier I had in fact been on course (just moving slowly) so I decided that pressing on was the right decision here too. Eventually I hit a track, which definitely wasn’t on the route. And also realised that I’d moved away from the lights of Cricklade. I briefly considered trying to go ‘cross-country’ to get back on track, but decided to play it safe and back-track. Looking at the map afterwards, going cross-country would have involved several river crossings and would have been disastrous. I eventually found the turn I missed a couple of hundred metres back from where I first got suspicious I’d gone wrong. And mentally kicked myself hard. I’m not sure quite how much time I lost. At least 20 minutes, it could quite possibly have been longer (I’d completely lost track of how fast, or slow, time was passing). On the other-hand repeatedly turning back prematurely, or carrying (and faffing around with) a GPS could have cost me longer. I eventually arrived in Cricklade around dawn and couldn’t resist a quick nap in the church porch. As usual I set my alarm for 5 minutes, but woke up 10 minutes later, shivering. I plodded on. The rain had stopped, but I was wet and struggling to warm up. I was desperately willing the Sun to break through the clouds. And beginning to wonder whether it was safe for me to continue, given how cold and sleepy I was. In the maze of the lakes of the Cotswold water park I spotted someone ahead moving slowly. I pushed to try and catch them, but soon ran out of steam and sat down for a(nother) rest. I eventually caught Lee S (who’d passed me when I went off route) as he looked for a turn in Ashton Keynes. After a brief chat, I took the lead and route marched us along a path through another set of lakes. The pace was unsustainable, but it did warm me up enough to take off one of my jackets. We then continued past more lakes and through fields at a more sedate pace. We weren’t a particularly cheery pair. Lee had been carrying an ankle injury for a long way and was pretty miserable and I was miserable for no good reason. I morphed into one of those people who bang on about races they’ve done, but with a spin to match my state of mind (‘’Spine race, bog, blah, ldwa 100s, styles, blah, UTMB, cutoffs too tight, too many people, blah”). Just before Ewen we nearly went off route. We were contemplating splashing through a small river, until Lee pointed out the lack of footprints meant it probably wasn’t the right way. The actual route contoured around the edge of the fields and through a herd of lazy cows who didn’t want to move. The last few fields were interminable. They weren’t particularly steep or overgrown, but it felt like crawling up a mountain. Someone appeared walking in the opposite direction. I initially thought they were coming out to meet us, but it was just an ordinary walker. The path wasn’t particularly clear and I went ahead to scout out the route, and shouted back to Lee (who was getting increasingly miserable) once I’d found it. Eventually the finish came into sight: a gazebo, a small crowd of people and the infamous stone. I put on a bit of a finishing jog (the closest to running I’d got in 24 hours) and came to a halt under the gazebo. But no the official finish was the stone, a few, uphill, metres away. After leaning on the stone, I put my extra layers of clothes back on (for some reason, jumping into my waterproof trousers, a manoeuvre that could have gone very badly wrong) and phoned the OH to let him know I had, finally, finished. Shane, the organiser, plied me with chocolate and I told him it was the 2nd hardest thing I’d ever done. The finish line set up was very efficient. We were walked to the nearby pub, where there was a tent with hot soup and space to change into clean, dry clothes. A bit later I got a lift to the train station, where there were lots of people talking bumpkin (my native language) which made me realise quite how far I’d run-walked. There were 69 starters. Of the 17 finishers I was 9th in 72h 32 min. However the finishing place is somewhat flattering. 8th place was nearly 8 hours in front of me and the last finishers were only just over 4 hours behind. On my ‘how hard is it for someone slow like me to finish comfortably within the time-limit’ scale (where Ironman is a 1, a flat 100 a 2, GUCR a 3 and the Spine an 8) the T184 is a 4. But I made it feel like a 5 by starting with over-ambitious goals.